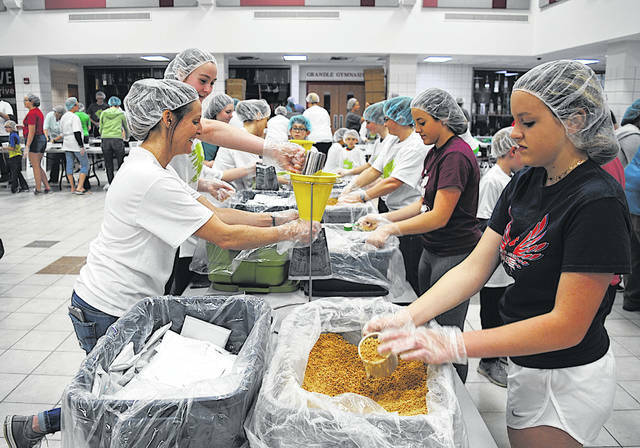 Volunteers at Fairfield High School are shown Saturday afternoon preparing what turned out to be 50,272 meals for the iBELIEVE Foundation. All the meals were donated to Highland County organizations. Volunteers at the Fairfield Local Schools gave quick meal prep a whole new meaning Saturday when they made 50,272 meals for Highland County food pantries through a program sponsored by The iBELIEVE Foundation’s iSERVE project. And they did it in about 140 minutes. As upbeat music played in the background and participants periodically clapped their hands to the beat, about 125 volunteers organized in assembly lines went to work, making about 2,000 meals every five minutes. The meals went to Highland County Community Action, the Highland County Homeless Shelter, the Because He Lives Food Pantry in Lynchburg and the food pantry in Leesburg, as selected by the Fairfield students that helped organize the event. “It was a tremendous experience. We had kids from before school and kindergarten to elderly residents. It gives the kids a chance to give back to their community,” said Denise Mootz, the Fairfield athletic director and assistant principal who also directs the school’s iBELIEVE program. It all started last summer when seven members of this year’s FHS sophomore class — Madison Miller, Cohen Frost, Connor Priest, Orrie Friend, Jaden Smith, Morgan Richmond and Cody Ayres — after being recommended by their teachers, attended a five-day iBELIEVE Foundation leadership summit at East Tennessee State University. The summit was designed to instill leadership skills in students from the Appalachian region. When they returned, their job was to pass those skills on to their classmates and others. They organized their classmates into teams, had those classmates serve as mentors to fifth graders, and organized fundraisers and other events. Friday, the day before the meals were prepared, the seven students and Mootz were awarded the Terri Kusner Spirit of iBELIEVE Award at the eighth annual Columbus Benefit Gala at the Jerome Schottenstein Center in Columbus. “They were recognized because of the hard work the students and Denise have demonstrated throughout the year,” said DaVonti’ D. Haynes, assistant director of operations for The iBELIEVE Foundation. The 50,000-plus meals created at Fairfield contained cheesy rice and vegetables, with 10 grams of protein, 19 vitamins and minerals, and just 680 mg of sodium per serving. “This delicious meal is easily and quickly prepared by adding the entire contents of the package to eight cups of boiling water on the stovetop, reducing the heat to simmer, and cooking for 20 minutes,” Haynes said. iSERVE is The iBELIEVE Foundation’s pathway to mobilize youth and community members to engage in activism by completing community service projects across the Appalachian region. Events similar to the one at Fairfield were also held Saturday at Ohio University and West Virginia University. Youth have the opportunity to connect with a plethora of other diverse, committed youth, and work alongside schools, youth organizations, nonprofits, community organizations, national service programs, and adult mentors to address the region’s most critical issues and change their communities, an iBELIEVE Foundation news release said. “Our goal is to bring people from across the region together for a crazy fun Feed-the-Funnel party to pack thousands of delicious, healthy meals for local food pantries across the Appalachian Ohio and West Virginia region. Meals packed in the community, by the community, for community,” the news release said. Feed-the-Funnel is a collaborative service learning project engineered by The Pack Shack, a nonprofit dedicated to eliminating food deprivation. The foundation said it focuses on Appalachia because more than one-fourth of children in the region face food insecurity and relatively high rates of obesity, which can negatively affect their health. The impact of these shortages is most often felt among low-income children, who face numerous barriers to reliable sources of healthy foods. While there are federal and state programs that try to address child food insecurity, many low-income Appalachian children face participation barriers such as limited community participation and inadequate transportation, the news release said. “We’re just trying to teach the kids to give back,” Mootz said.